Napa Valley’s vineyards and Michelin stars are just part of the story. The region is also an unexpected destination for a wellness vacation. Here are a few suggestions on where to find your “OM” in Napa Valley. The adults-only Auberge du Soleil is nestled in a sunlit olive grove and home to La Pagode, a private Japanese ryokan-style pavilion. The open-air studio, which offers daily complimentary yoga and meditation classes, is secluded within the property’s expansive outdoor sculpture garden, featuring 100 works by California-based artists. Bardessono, the only LEED Platinum-certified hotel in Napa Valley, making it the pinnacle in sustainable luxury, offers weekly complimentary yoga classes on its rooftop pool deck. Almost everything at the hotel, from the bed linens to the seasonal menu, is organic and sourced from within a 100 mile-radius from the hotel. Not a single tree was disturbed in the building of the car-free property at Calistoga Ranch, giving the place a quiet canyon feeling. Hike the property’s exclusive trail to Davis Estate Winery for a morning stretch in their restored 1916 barn, followed by private wine tasting. Carneros Resort and Spa in Napa offers weekly complimentary yoga classes in their 3,000-square-foot fitness studio. Guided meditation classes are also available throughout the month. The spa recently unveiled a $3.5 million renovation in July 2018, which includes newly-designed treatment rooms and an expanded relaxation area. Therapies such as “Tune Me Up” ends in a reclining Zero Gravity Chair, creating a deep relaxation experience for the mind and body. Framed by beautiful white roses, 320 California Redwood trees, and views of the Mayacamas Mountains, Harvest Inn’s Vin Rose garden in St. Helena offers the ideal setting for self-guided meditation. Hotel Yountville’s guest suites each feature an outdoor balcony or patio space for enjoying a slow morning with quiet meditation. Private nooks may also be found among the landscaped grounds with its meandering paths and gurgling fountains. Guests may partake in a yoga class at Indian Springs Resort’s aptly named Buddha Pond, a lush, green, quiet oasis. The property is also home to an Olympic-size mineral pool fed by Calistoga’s natural geothermal geyser water. Las Alcobas in St. Helena offers the “Suite Cocoons” weekend retreat package, which includes a 30-minute guided meditation class in the comfort of one’s private balcony. The resort also features a dedicated yoga/meditation studio open 24-hours. 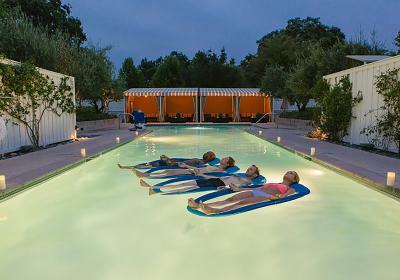 Solage Calistoga offers floating meditation classes in its geothermal mineral pool (pictured above). Guests are led through a calming sequence of visualization and breathing exercises while floating on rafts in the 130-foot pool that is warmed to body temperature, or approximately 98 degrees Fahrenheit/37 degrees Celsius.